We wanted to create a better way for artists to find what they are looking for and a more effective way for organizations to get their opportunities in front of the right audience. Artwork Archive has just released another resource focused on arming artists with the tools they need to grow their careers. Artists are always on the lookout for opportunities to advance their career and calls are an important part of that search. “There are a lot of resources out there for calls, but it can be challenging for artists to find opportunities that are relevant. 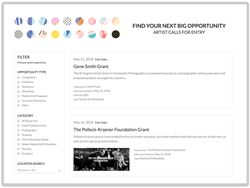 We wanted to create a better way for artists to find what they are looking for and a more effective way for organizations to get their opportunities in front of the right audience,” said Justin Anthony, Co-Founder of Artwork Archive. Their Call-for-Entry page (https://www.artworkarchive.com/call-for-entry) is an answer to the ongoing requests for information of this type and fills a void in the space. “Artists already see us as a go to resource for all manner of art-related advice and content so this was a natural addition for us,” said John Feustel, Co-Founder. Location based searching and additional filter options simplify the search process and save artists time. For individuals and organizations looking to post their opportunity, the optimized submission process and clean interface simplifies data entry and provides a great way to get their information in front of the very audience they are looking to attract. And, what started out as a smaller audience has now grown into a global community of over 100k artists spanning 50 countries which makes it a perfect opportunity to market workshops, juried competitions, exhibitions, residencies, public art proposals and more. This new feature also pairs incredibly well with Artwork Archive’s Exhibition Tracking, a feature that helps artists avoid missing key deadlines like submission dates and records all details related to their shows and competitions. Artwork Archive’s recent Enhanced Sharing feature also gives artists the ability to store and share images and documents required by most call-for-entry submissions. To learn more about the new release, expansion plans, or anything else related to this release, please contact Justin Anthony by email at justin(at)artworkarchive.com or visit the website at http://www.artworkarchive.com. About Artwork Archive: Artwork Archive is an industry-leading art inventory management tool used by artists, collectors and organizations around the world to organize and manage their artwork.